Various non Keynesians have argued that the pattern of public spending and GDP in the USA during the current recovery (that is since June 2009) undermines the Keynesian hypothesis that the Government spending multiplier is positive. In particular JOhn Cochrane and Tyler Cowen argue that, if Keynesians were right, sequestration should have caused at least a decline in GDP growth rates. ...19 data points can’t prove anything, but the few data support the Keynesian hypothesis about as strongly as could be imagined. I am impressed by the unreliability of casual empiricism conducted by idealogues. Some people look at this period and see the opposite of what I see. Even now, I am shocked that economists didn’t bother to look up the data on FRED before making nonsensical claims of fact. From Waldmann's standpoint, this is even better - a correlation coefficient of 0.50 to his 0.34. That doesn't look so great. 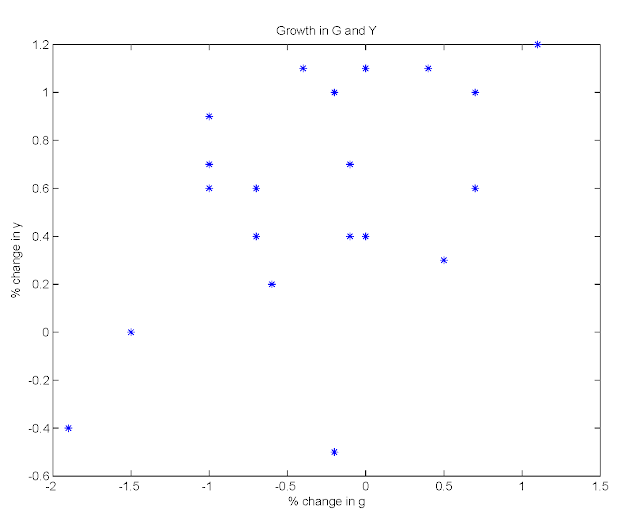 In that scatter plot, the correlation coefficient is -0.12 which, by Waldmann's criteria, would be a win for the non-Keynesians. But, my cat is is looking over my shoulder and telling me "not so fast." My cat, in addition to knowing FRED, also took an intro-to-macro course, and knows all about the Keynesian Cross. She's a big Paul Krugman fan too. Here, 1/(1-c) is the multiplier. Krugman, with whom Waldmann appears to be quite sympathetic, has told us that IS/LM is truth, truth is IS/LM - that is all we know on earth, and all we need to know. Better than that, since late 2008, when we entered the liquidity trap and the LM curve became flat, Keynesian Cross has become our even simpler truth. My cat agrees that (3) and (4) are rich with implications and policy conclusions. She has also pointed out that it's not quite fair to be drawing conclusions from the last chart above. Suppose, says my cat, that A and I are random variables, that the government sees the realizations of A and I before choosing G, and that the government has a target level of output, Y*. 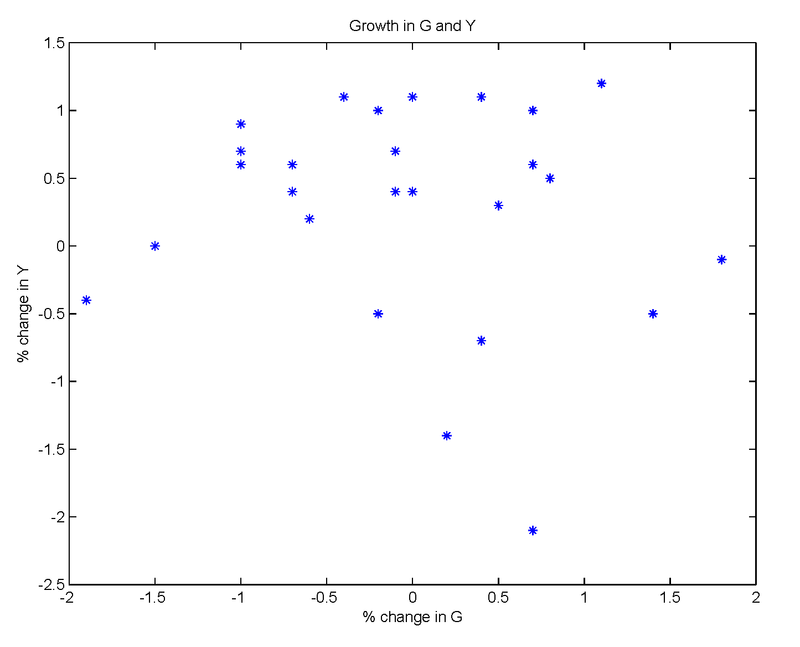 Then, Y = Y* and Y and G would be uncorrelated. Alternatively, suppose that the government is constrained, so that it can only close a fraction of the output gap, under any circumstances. Then, we could observe something like the last chart. There was a big demand shock in 2008, the government didn't do enough, and so we see government spending going up when output is going down during 2008. I showed my cat how to use Matlab to compute the correlation coefficient for the data in the chart, and she gets -0.07. Now she's pissed, and is hiding under the sofa. Obviously, my cat has a lot to learn. I'll have her read Hal Cole's post on the aggregate effects of government spending, for starters. It's also important that my cat understand that there are few economic policy problems that can be solved in a blog post. We're very lucky if looking at raw correlations helps us to discriminate among economic models, or to draw policy conclusions. 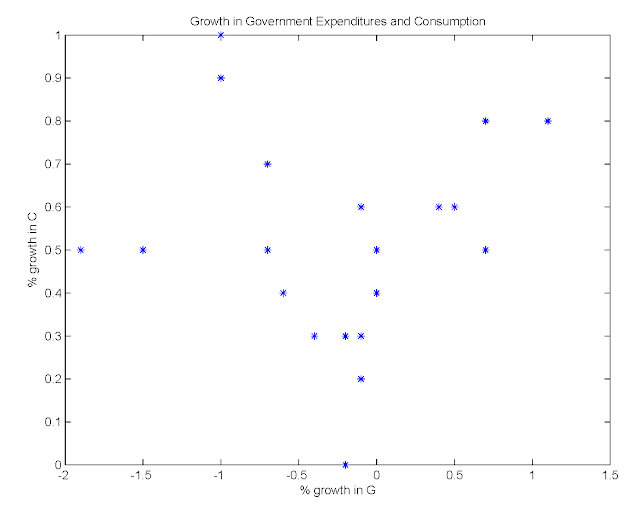 Indeed, normal economics tells us that there are various mechanisms by which increases in government spending can cause aggregate output to increase. Government spending could be totally unproductive, but lead to an increase in output because of a wealth effect on labor supply. Government spending could be complementary to private consumption, and if the complementarities are large enough, there could be large multipliers. There could be multiple equilibria. But, when we start to think in terms of normal economics, it becomes clear that the effects of government spending depend on what the government spends on, how the spending is financed, etc. And we start asking more questions - interesting ones. Indeed, I think my cat would quickly go back to watching squirrels, if (1)-(4) were all the economics she had to think about. I'm going to try to clear up some issues in the blog discussion among Ambrose Evans-Pritchard, Paul Krugman, and Simon Wren-Lewis, among others, about zero-lower-bound monetary policy. Rather than parse the thoughts of others, I'll start from scratch, and hopefully you'll be less confused. The dispute is over whether central banks can generate inflation even when interest rates are zero. We'll simplify things by assuming that there are only two assets, money and one-period government bonds, and no unsecured credit. We can be more explicit about how assets are used in transactions, but to make a long story short, think like Lucas and Stokey. There are two kinds of consumption goods. The first can be purchased only with money, and the second can be purchased with money or government bonds. We can think of this as standing in for intermediated transactions. That is, people don't literally make transactions with government bonds, but with the liabilities of financial intermediaries that hold government bonds as assets. We can also extend this to more elaborate economies in which government debt serves as collateral, to support credit and intermediation, but allowing government bonds to be used directly in transactions gets at the general idea. where T* is the real transfer at each succeeding date, and i is the inflation rate, which is constant for all time. This is basically a Friedman rule equilibrium, and we could use results in Ricardo Lagos's work, for example, to show that there exists a wide array of paths for the consolidated government debt that support the Friedman rule equilibrium. An extra condition we require here is that this economy be sufficiently monetized, i.e. so that the central bank's balance sheet is sufficiently large, and there is enough money to finance consumption of the good that must be purchased with money. The Friedman rule equilibrium is Ricardian. At the margin, government debt is irrelevant. 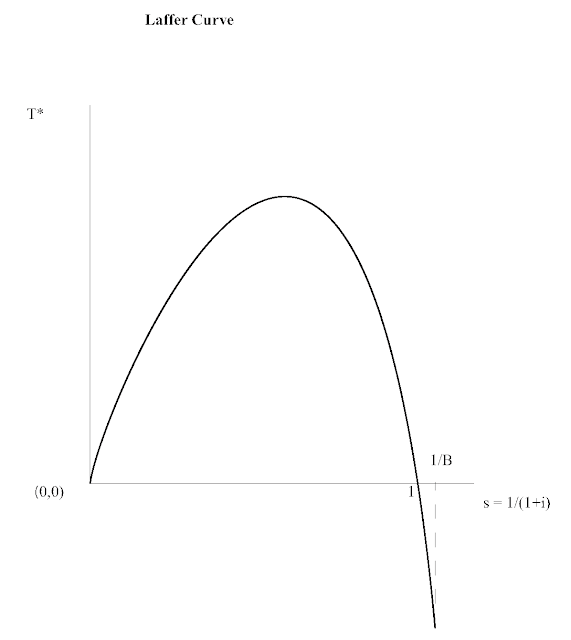 As well, there is a liquidity trap - open market operations, i.e. swaps of money for government bonds by the central bank, are irrelevant. Thus, the central bank cannot create more inflation. But neither can the fiscal authority. What about helicopter drops? Surely the fiscal authority can issue nominal bonds at a higher rate, and the central bank could purchase them all? But, as long as government bonds are not scarce, equation (3) must hold at the zero lower bound, which determines the rate of inflation. Basically, this is the curse of Irving Fisher. Under these conditions, it is impossible to have higher inflation at the zero lower bound. Helicopter drops may indeed raise the rate of inflation, but this must necessarily imply a departure from the zero lower bound. Note as well, that in this equilibrium, y = m + b, so the total quantity of consolidated government debt constrains output. Clearly, this equilibrium is non-Ricardian - government debt matters in an obvious way. But, there's still a liquidity trap. If the central bank swaps money for bonds, this is irrelevant. The central bank can't change the rate of inflation through asset swaps. In (9) and (10), s = 1/(1+i), 1 - s is the effective tax rate on consolidated government debt, and T* is the revenue from the inflation tax, where the inflation tax applies to the entire outstanding nominal consolidated government debt. So, if the fiscal authority chooses an inflation rate i > 1/B -1, then it expands the government debt at the rate i per period, the central bank buys enough of that debt each period that the nominal interest rate is zero forever, and the government collects enough revenue from inflation every year to fund a real transfer T* which, as a function of s, is shown in the next chart. Note that this is essentially a Laffer curve. Infinite inflation (s = 0) implies zero revenue from the inflation tax, as does zero inflation (s = 1), and transfers are negative when the inflation rate is negative (s > 1). The higher the rate of inflation, the lower is the real quantity of consolidated government debt, output and consumption - more inflation reduces welfare. The central bank cannot control inflation, but the fiscal authority can. Therefore, in this model, it is indeed correct to state that, at the zero lower bound, the central bank has no control over the inflation rate. The fiscal authority may be able to control inflation at the zero lower bound, but only by tightening liquidity constraints and increasing the liquidity premium on government debt. Of course, in this model the government debt all matures in one period. What about quantitative easing? QE may indeed matter, particularly when government debt is scarce. In a couple of papers (this one and this one) I explore how QE might matter in the context of binding collateral constraints. First, if long-maturity government debt is worse collateral than is short-maturity debt, then central bank purchases of long-maturity government debt matter. As well, if the central bank purchases private assets, this can circumvent suboptimal fiscal policy that is excessively restricting the supply of government debt. But in both cases this works in perhaps unexpected ways. In both cases, unconventional asset purchases by the central bank act to reduce inflation. Sociology: the scientific analysis of a social institution as a functioning whole and as it relates to the rest of society. So, that seems very promising. Some scientists, who specialize in the analysis of institutions and the role those institutions play in society, are going to figure out the economics profession. Here's what I'm thinking. I've never taken a sociology course, but being a social scientist maybe I can guess how a sociologist might think about the institution of economics. What is the social role of the economics profession? 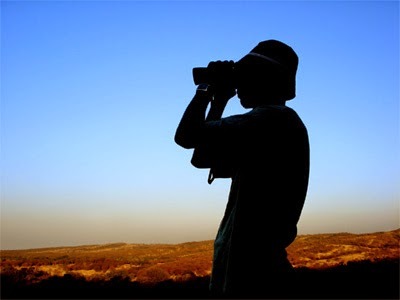 First, human beings have a need for pure scientific knowledge - we just want to know what is going on. How do economic systems work? Why are some countries and individuals so poor, and why are some so rich? 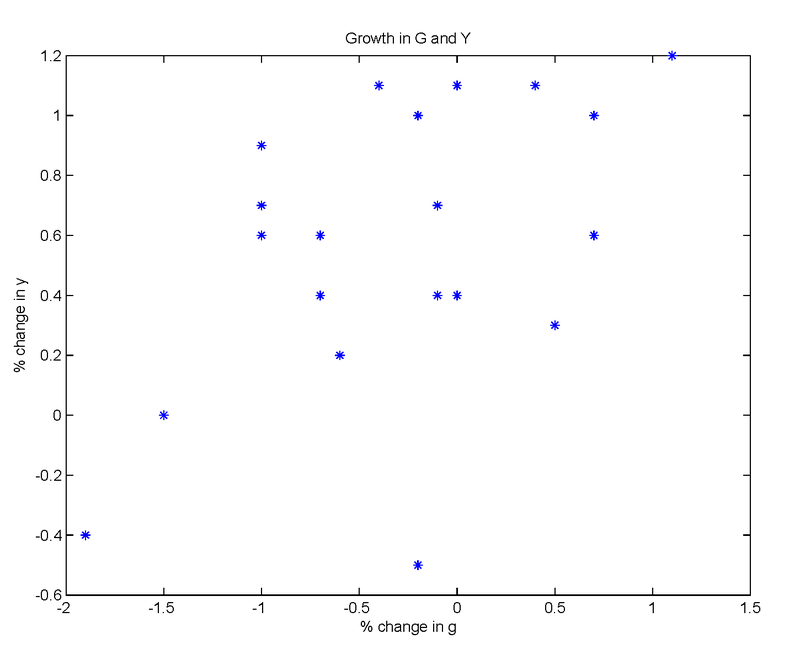 Why do prices of goods, services, and assets move around over time? Second, human beings have a need for applied science. How do we take what we know about economics and use that knowledge to make human beings collectively better off? Third, we might be interested in where economics came from. Who were the first economists, and how did they put together the seeds of economic knowledge? How is the economics profession organized? How is economics taught? Fourth, what makes economics different from other disciplines? If there are large differences in economics, are the human beings who do economics somehow different, for example do they self-select as economists due to particular skills they possess? Is economics different by chance, or is there something about the nature of things that economists study that makes the field different? Finally, how does the organizational structure of the economics profession help it to perform its key social role? Are there ways we could improve on this organizational structure? This could be pretty interesting, and I'm pleased, in principle, that there are scientists who care about these things, and are willing to help out. First, I'll tell you some of what I know about the economics profession. Economics is clearly successful - in economic terms. Economics is a high enrollment major in most universities, one can make a decent living selling economics textbooks to undergraduates (as I can attest), an economics undergrad major pays off handsomely, and PhD economists are very well-paid - as academics, in the financial sector, and in government. Economists are also influential. They are called on to run key interational institutions like the IMF and World Bank, they more often than not serve as the chief officers in central banks, and they hold important positions in government. Further - and this must be unique among scientific pursuits - you can become extremely rich as a specialist in bad-mouthing your fellow economists. Economics is very different from other academic pursuits, as any economist who has had to educate a Dean (of Liberal Arts, Social Sciences, Business, whatever) can tell you. In most academic fields, jobs are scarce, and mobility is low. Not so in economics. It is typically hard work to convince a Dean that one needs to make 8 job offers to fresh PhDs in the hope of getting one or two acceptances, that senior job candidates may be even harder to get, and that departures from your economics department need not mean that good people are fleeing a bad department. Salaries are always an issue. Basically, you need to know some economics (though not much) to understand why the economists are paid much more than the philosophers. Economists have a well-organized fresh-PhD job market that operates under clear rules, and performs the function of matching young economists with employers. Economists are social and love to argue. If you are uninitiated and happen to walk into an economics seminar, you might think you should call the police. Don't worry, it's OK.
Fourcade et al. get some of the facts right, but I came away puzzled. Some data is marshalled, but I wouldn't call this paper science, and it's unclear what we are supposed to learn. The first argument the authors want to make is that economics is "insular." By this they mean that economists don't pay much attention to the other social sciences. The evidence for this is citations - apparently the flow of citations is smaller from economics to the rest of the social sciences than the other way around. Whether this is a good way to measure interaction is not clear. There is a very active area of research in economics - behavioral economics - that uses developments in psychology extensively. There is extensive interaction between economists and political scientists - especially those interested in game theory. But I don't think I have ever encountered a sociologist in an economics seminar, or at a conference. However, suppose that economists totally ignored the other social sciences. Could we then conclude that this is suboptimal? Of course not. Maybe what is going on in the rest of the social sciences is actually of no use to economists. Maybe it is of some use to us. Certainly Fourcade et al. don't give us any specific examples of things we're ignoring that might help us out. And economists are far from insular, especially if we look beyond the social sciences. Economics is a big tent. To gain admission to an economics PhD program requires some background in mathematics and statistics typically, but we don't necessarily require an undergraduate economics degree. People come into economics from history, engineering, math, psychology, and many other fields. As well, an undergraduate degree in economics is an excellent stepping stone to other things - professional degrees in business and law, or graduate degrees in other social sciences. Economic science did not come out of nowhere. Indeed, it often went by "Political Economy" in the early days, and sometimes still does. Most of our technical tools came from mathematicians and statisticians, though econometricians have developed sophisticated statistical tools designed specifically to deal with inference problems specific to economics, and macroeconomists took the dynamic optimization methods invented by mathematicians and engineers and adapted them to general equilibrium economic problems. The authors of "The Superiority of Economists" see us as hierarchical, with a power elite that controls the profession. PhD programs are indistinguishable, and publication and recruiting are regimented. Seems more like the army than an institution that is supposed to foster economic science. Well, baloney. People of course recognize a quality ranking in academic institutions, journals, and individual economists, but I don't think that's much different from what you see in other fields. Powerful people can dominate particular subfields, but good ideas win out ultimately, I think. In the 1970s, there was a revolution in macroeconomics. That did not happen because the research of the people involved was supported by the Ivy League - far from it. But modern macro research found supporters in lesser-known places like Carnegie-Mellon University, the University of Minnesota, and the University of Rochester. People like Bob Lucas and Ed Prescott got their papers published in good places - eventually - and then got their share of Nobel Prizes in Economics. The economics profession, though it could do better in attracting women, is very heterogeneous. I have no hard evidence for this, but my impression is that the fraction of foreigners teaching economics in American universities is among the highest across academic disciplines. I don't think you would see that in a rigid profession. Ultimately, Fourcade et al. think that our biggest problem is our self-regard. Of course, people with high self-regard are very visible, by definition, so outsiders are bound to get a distorted picture. We're not all Larry Summers clones. But if we do, on average, have a high level of self-regard, maybe that's just defensive. Economists typically get little sympathy from any direction. In universities, people in the humanities hate us, the other social scientists (like Fourcade et al.) think we're assholes, and if we have to live in business schools we're thought to be impractical. Natural scientists seem to think we're pretending to be physicists. In the St. Louis Fed, where I currently reside, I think the non-economists just think we're weird. Oh well. It's a dirty job. Someone has to do it.